MM: Were you surprised by the reaction to the first show? PCC: We were hoping it would be a success but we didn’t expect the amount of very positive feedback we received from everyone, from exhibitors to guests and the general public. We felt very flattered that we seemed to put on a show that everyone who attended it enjoyed. MM: With just six weeks to go until the show, what can you tell us about what we can expect for the second year of Portsmouth? 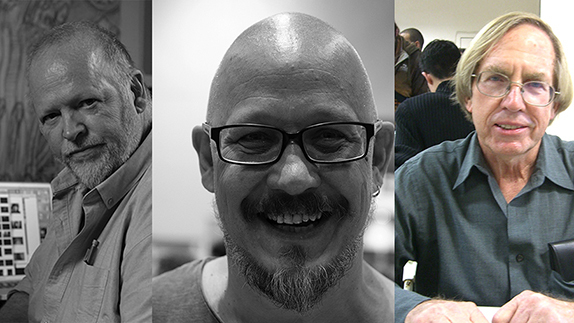 PCC: We have gathered another very strong line-up of guests from the UK and the US. This time around we have Liam Sharp, who is currently the hot artist on DC’s The Green Lantern, Marvel and DC legend Roy Thomas, legendary Batman writer Steve Englehart, artist Tomm Coker, artist Tommy Lee Edwards and Star Wars artist Russell Walks, who is back again. In terms of UK talent, we have Game of Thrones concept and storyboard artist William Simpson, Sean Phillips, Chris Weston, Rob Williams, Alison Sampson and Laurence Campbell. MM: The first year was a fairly big success. How have you been building on that with the second one? PCC: We were very proud of the first year with the presence of guests like Walter and Louise Simonson so we wanted to make sure that the quality of the guests was up there for the second one and we also wanted to keep it a show that celebrated comics in all of its forms too. MM: What new elements have been added for the second year? PCC: For the first time, we have the Tripwire Awards, with the ceremony being held on the Saturday night at the show. Hosted by Jasper Bark, people can still vote for these until 30 April. We are very excited about this and hope it will be a regular fixture at the show. We shall also be having a Batman 80th anniversary exhibition, reproducing some of the character’s key covers and art over its long history and there will also be an extensive Game of Thrones exhibition showcasing William Simpson’s art. Since it’s the 4 May too, Star Wars day, the Isle of Wight Prop Crew will also be bringing with them movie quality, full sized display speeder bikes, both of these displayed on the backdrop of a large, authentically reproduced Endor Bunker image. MM: You had a number of editors for the first year. Which editors do you have at this year’s event? PCC: We did have a lot of editors for the first year and this year we are proud to welcome back Dirk Wood, from IDW. We shall also be welcoming Scott Dunbier, who is in charge of IDW’s Artist’s and Artifact Editions. He hasn’t been over here in many years and the fact that 2019 is IDW’s 20th anniversary is a nice reason to have them at the show. We shall be celebrating this at Portsmouth in 2019. MM: What have you learnt from the first year that you have applied for the second time? PCC: We have learnt that the show needs to be focused on comics rather than celebrities, as the comic guests were the show’s strength in its first year. We also have worked on our panel programming this year as well, offering fewer panels but ones which are of a higher quality. We are using the council chambers, which proved such a hit in its first year, with just a few located in other places. MM: What else is new for this second year? PCC: We are introducing a new outside space which will feature even more exhibitors and guests. As the main hall sold out, we wanted to offer people who wanted to set up at the show another option so they could still be there. If the weather is as beautiful as it was last year, then it will be a great addition to the show. MM: Which guests are you most proud of attracting to this year’s show? PCC: All of the guests are great additions to this year’s Portsmouth but if I had to choose, it would probably be Roy Thomas, just because of his stature as a major Marvel and DC lynchpin, and Liam Sharp, because there is such a buzz around The Green Lantern series. MM: Are you already making plans for a third Portsmouth Comic Con? PCC: It is slightly early but we are already considering our plans for a third show at the Guildhall. We need to get the second one under our belt before we can start to properly plan for it but it is fairly certain that we shall be back in May 2020.